This is my Bogue Profumo NOUN Review, Noun by Bogue Profumo fragrance review. A Lucky Scent 15th Anniversary fragrance release, Bogue Profumo NOUN is truly a one of kind fragrance, a green, spicy, aromatic, woody, animalic fragrance. And for an anniversary it totally makes sense to create a truly one of a kind scent for the public to consume. To me, NOUN is all about the herbs and spices mostly with the woody notes as it dries down. The floral notes do pop up but they are not dominant. 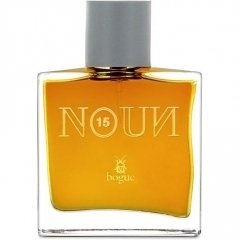 Please watch my YouTube review to find out all about NOUN by BOGUE PROFUMO created by Antonio Gardoni for Lucky Scent’s 15th Year Anniversary. 9.5, I'd say and just out. Bogue calls this fragrance Noun, which refers to a person, place, or thing, though not one in particular, i.e., a car, rather than a Lamborgini; a woman, rather than Marilyn Monroe; a scent rather than a specific perfume. To me, it's as if Antonio Gardonio set out to create a noun-like fragrance that, in making no particular statement shines. This is my second day wearing it and the first day I was confused. Noun isn't the spectacular headiness of his crowning achievement, Gardelia, not the "I am a duchess, thank you," sophistication of MEM nor the spendid animalic chypre that is Maai. Noun says, "I am scent. Smell me." That's all. Smell my florals, smell my woods, smell my spices and herbs. They won't transport you anywhere but here, smelling scent for the noun that it is. Apropos, if you ask me, for Gardoni's 15th anniversary gift to Luckyscent, a purveyor of almost all of them. Apparently, I have bottle no. 9 of 50. Best scoot, if you want one. Write the first Review for Noun!